As a result of serving during the Korean War, Staff Sgt. Reckless was awarded two Purple Hearts, Marine Corps Good Conduct Medal, a Presidential Unit Citation with star, Navy Unit Commendation, National Defense Service Medal, Korean Service Medal, United Nations Korean Service Medal and Republic of Korea Presidential Unit Citation. That is quite a list of commendations, particularly for a pony sized mare. 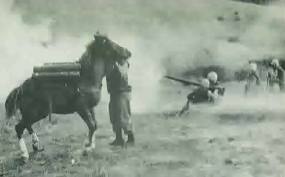 Lieutenant Eric Pedersen the commanding officer of the Recoilless Rifle Platoon, Antitank Company, Fifth Marine Regiment, decided that his men needed a horse to help carry the 24 lb. rounds of ammunition for the Recoilless, an antitank weapon, so in Oct. of 1952 he headed to Seoul with 2 other men in search of a suitable animal. His search ended at the race track where he bought a small chestnut mare from a young Korean man using $250 of his own money. The young Korean loved his horse but his sister had suffered a leg amputation and he wanted to afford an artificial limb for her, so he parted with his horse. Sgt Latham was charged with putting Reckless through “hoof Training” and he taught her to cross barbed wire, lay down on command, hide in the bunker and all of the other skills she’d need to carry 6-8 of the 24 lb. rounds for the Recoilless. Reckless had other jobs, in addition to carrying the heavy ammo. She hauled the telephone wire as it was set, making the job go faster than it normally would. She also packed grenades, small-arms ammunition, rations, sleeping bags, and barbed wire. During the Battle of Vegas, Reckless demonstrated amazing courage and endurance, making 51 trips, carrying a total of 386 rounds, which equaled 9,000+ pounds of explosives. She covered a total of about 35 miles over rough, steep terrain , all while under fire of about 500 artillery rounds an hour and twice wounded. Most of the trips that Reckless made carrying the ammunition, she made on her own, without a handler. She was truly a special horse. 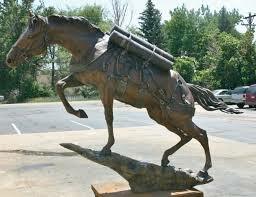 On July 26, 2013 one of Robin Hutton’s Memorial goals was achieved when a beautiful 10 foot bronze of Reckless traveling up hill in full pack was placed at Semper Fidelis Memorial Park, adjacent to the National Museum of the Marine Corps. In 1955 Andrew Geer wrote a book about reckless that’s currently out of print. If you go to http://archive.org/details/recklessprideoft011755mbp you can down load a free copy; pdf, e-book, kindle, or read it online. Geer also writes about the young Korean who raised Reckless and gives us a better picture of life in Korea during that era. “Reckless, Pride of the Marines” is a fascinating read and once you go through it you may decide it’s a story to share with youngster’s as well. 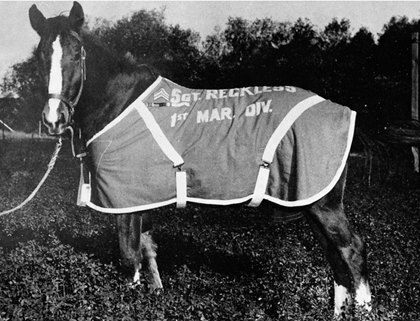 And while I recommend that you check out Robin Hutton’s efforts about Reckless, as well as all of the current online news about America’s War Horse, don’t miss reading Geer’s account that was written so freshly after the Korean War. 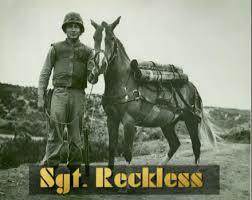 I hope you’ll check out more about heroic Reckless, America’s War Horse and the men who loved her.